Creative title right? Not!!! But it’s what came to mind today. This has been created for the Ways to Use It Challenge over at Splitcoast Stampers and to keep me going on my Christmas cards. Very simple and easy to mass produce if the need be. This is a 4.25″ square card in Kraft. The wreath was stamped in Versamark ink and heat embossed with Hero Arts white embossing powder. Then I quickly added the berries with Stickles. Next comes the bow, that’s been cut out of some Authentique designer paper. The die is from Simon says Stamp…makes a quick and easy bow and is a really great size to work with. I added more Stickles to the bow and then stamped the sentiment from Technique Tuesday in Versafine Onyx Black ink. Hope you are well on your way to having your Christmas cards done! Back soon with more! What a fabulous wreath. Love it in white on the kraft! Love your wreath in white and what a pretty bow. I've probably got enough cards made but they are my favorite to make and I just keep on. Crazy me!!!!! So nice to see you blogging again Lee-Anne! 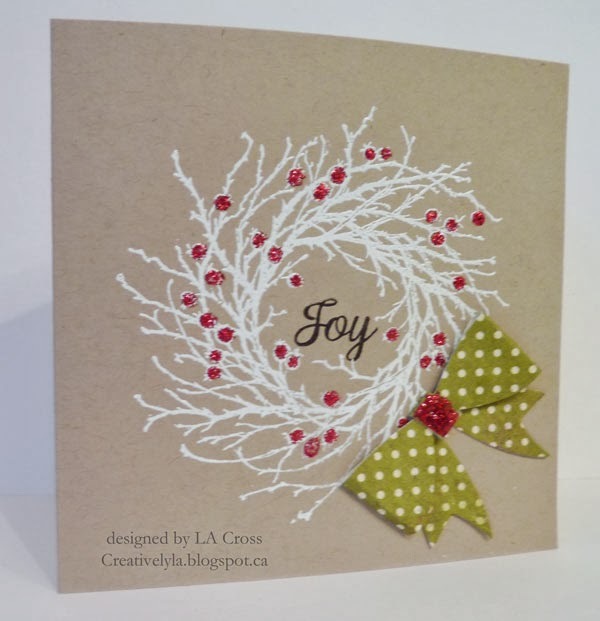 Fabulous card you created~Love the white on the Kraft and pops of red!